Timing is a bit funny sometimes. Liv and I crossed paths right before I moved to Nashville, when she was a fan in the meet and greet line at a benefit show with Leann Rimes, Sunny Sweeney and the JaneDear Girls. I was shooting the meet and greet photos that night. Fast forward a few years and she's now a Nashville resident and just released her first single. 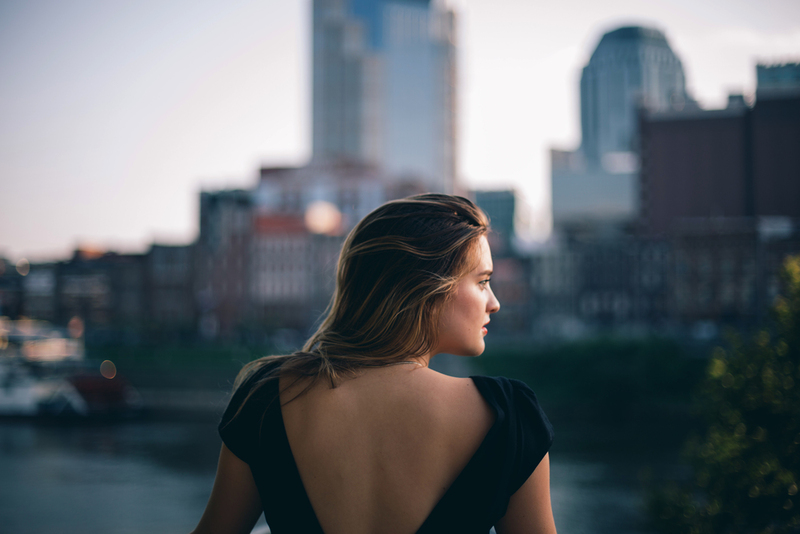 I wanted to collaborate with her and the timing worked out, so we spent Sunday evening driving around downtown Nashville looking for interesting lighting and backgrounds. It was a blast to shoot with her, and to reminisce over our childhood in Cleveland! I ended up getting my hands on a Canon 5D Mark III (I own a Mark II). so that was a fun experience for me. What really stuck out to me was the consistency of the auto focus system. Jumping to 61 AF points and four years of further development is a pretty drastic change. I'm still satisfied with the files my 5DII produces, but the difference in accuracy and consistency is pretty drastic. Most of these are shot with a 50mm F/1.4, which has a love-hate relationship with my 5D Mark II AF system. I ended up keeping it on my camera for the majority of the shoot- a first. 1. You and I are Cleveland kids - what’s your favorite memory from growing up in Cleveland? Ah, there’s so much I cherish about growing up in Cleveland. In high school my friends and I loved to spend time on the lake – fishing, boating, swimming etc. I have tons of fond memories shopping at the West Side Market and visiting the Aquarium. 2. When did you figure out that music was your passion and something worth pursuing? I knew in Junior High that I was gravitating towards music. I’d spend hours after school writing, singing, and practicing guitar. There was nothing else that interested me as much as songwriting. 3. Who are two of your biggest musical influences, and what do you admire about them? I adore Ed Sheeran. Not only is the man hilarious, but he also is an absolute poet. His songwriting abilities are exquisite. As a listener he gets you to think about emotions and situations from a fresh point of view. Another musical influence for me has been ZZ Ward. She’s got a bluesy, rock & roll vibe going that consumes me every time I hear her music. Not to mention she’s a strong female performer, which I love. 4. Why Nashville? I’ve had my eye on Nashville since Junior High. Someone once told me it was the place to be for music, so I made up my mind right then and there. I begged my parents to take me, and I finally found an excuse in High School with a college visit to Belmont University. One of the many things I love about Nashville is that it’s like a giant small-town. I run into people I know all of the time and everyone is so friendly. It’s a tight knit community, especially in the entertainment industry. 5. Favorite hang out spot in Nashville that only locals know? I love seeing concerts at Mercy Lounge. It’s an intimate atmosphere, and they always bring in great music. Also, I spend a lot of time on 12 South: between Sevier Park, Las Paletas, Frothy Monkey, and more, it has a ton to offer and is definitely a vibrant part of town where a lot of locals hang. 6. How has your time in Nashville helped you grow creatively? When people hear “Nashville,” they tend to think strictly country music. Though I love its country roots, Nashville also offers so many other diverse sounds. Since moving here, I’ve found a lot of eclectic indie, pop, and R&B music. I’m always discovering new genres in this town. I’m currently into the funk-soul vibe. I’m constantly being stretched as a musician and writer; I owe that to the creative beings that live here. 7. Other than being in the studio or on stage, what do you enjoy doing in your free time? When I’m not working on music, I love to go adventuring with my friends. We like to take day trips and explore Tennessee. Other than that you can find me hesitantly cliff jumping at Percy Priest, burning something in my kitchen, or attempting some weird art project at home. 8. Your single “Poison in the Blood” is your first single. How does it feel to have it out there for people to hear? It’s the best feeling being able to share the music. My producer, Jonathan Timberlake, and I have been working on this project for over a year and a half. I can’t believe our first installment is finally out! 9. Anything else?! I had a blast hanging with you and I can’t wait to do more shoots together in the future! You can buy “Poison In the Blood” on iTunes, Google Play, and Amazon. It’s also available for streaming on Spotify and Tidal!